Where have you been all my life! Omg…this is amazing and I cannot believe I just learned about it! (Btw…That’s 25 cents in the middle of the photo as a reference for size). And it comes Super Sanded which allows you to easily color on one side. (Apparently, other films may require you to take sandpaper and smooth it out before you get started. That seems like a lot of work so I would recommend using this one). When you open the package you will find that one side of the film is super slick and shiny vs. the other side which is a bit rough. To get started, I stamped my image using Staz-on ink on the slick side. Then I flipped it over and used a combination of Sharpie markers, pencil crayons and Copics to color the image. Overall, I like how the Sharpies and Copics look because it seems a little smoother in texture once it shrinks. 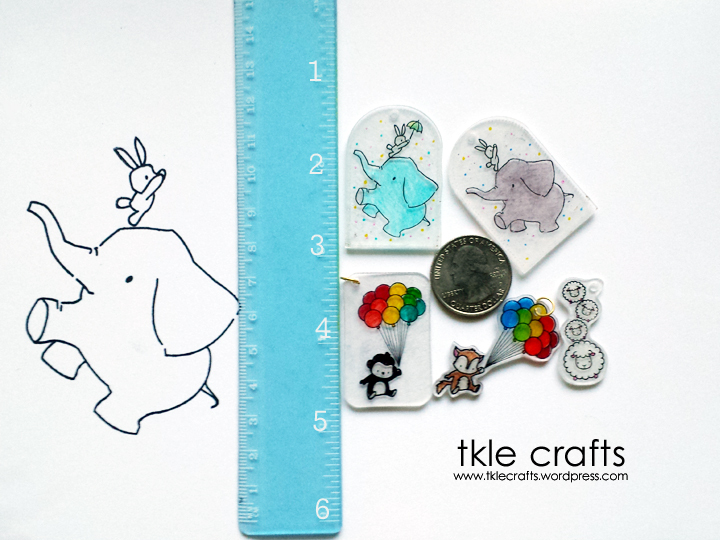 For instance, the blue elephant on the left was colored with Copics vs. the grey elephant on the right was colored with pencil crayons. I have to say, using a white pencil crayon on the images looks amazing so I will continue using that for my images. If you decide that you want to turn your creation into a charm for a keychain, bracelet or pendant – Be sure to hole punch the plastic before you start cutting away. So far I like how the images look when I cut around them vs. leaving a lot of empty space around the image. For some reason, the plastic around the image is not entirely clear and it might be because I’m using super sanded paper and thus it’s a little opaque. I will have to do some experimenting with different types of films and post an update! Once you are done trimming your creation you have two options to heat your film (1) Use your toaster oven or (2) use your heat gun. For the toaster oven option, I would follow instructions from this super cool YouTube video. 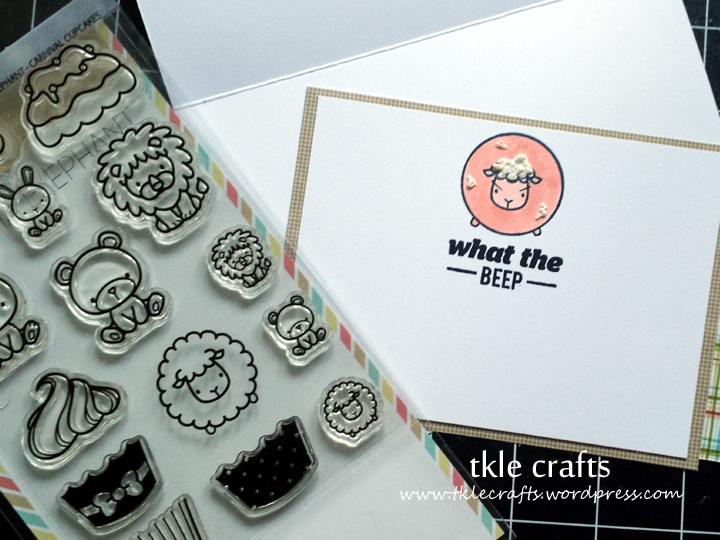 If you are a stamper like me then time to bust out your heat gun! Using a shoe box, line the shoe box with some parchment paper. 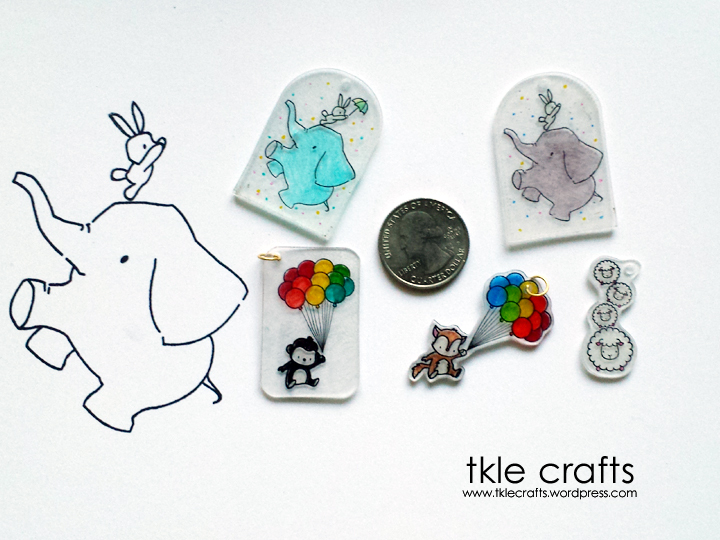 Then place the shrinky dink film with the rough side facing upwards. I used a wooden chopstick to hold the shrinky film down and then evenly went over the film using my heat gun. Be prepared, the film curls up and gets crazy looking but that is part of the process. It will curl up and then uncurl and start to flatten out. Once you see that it is flattening out, remove the heat gun and take a piece of parchment paper and lay it on top of the film (now hard plastic). 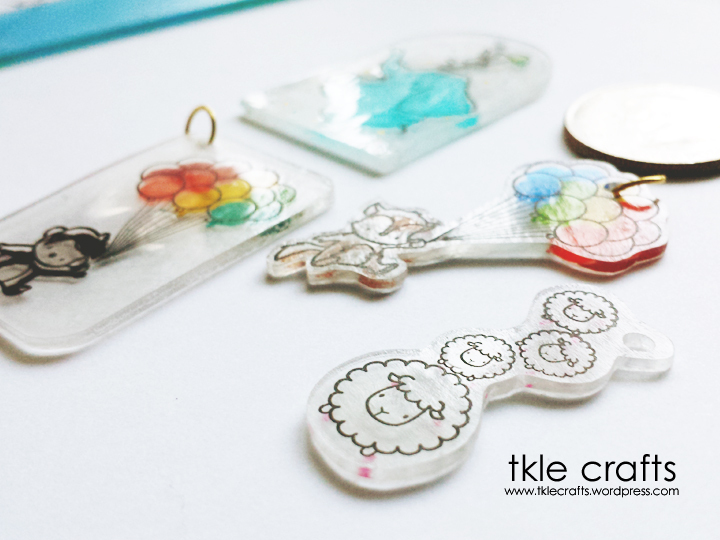 Take your acrylic clear stamping block and smush it down on the plastic so it will flatten out. As you can see, the images shrink down about 25% of its original size! (The original stamped image is on the left hand side and is about 3 inches tall. 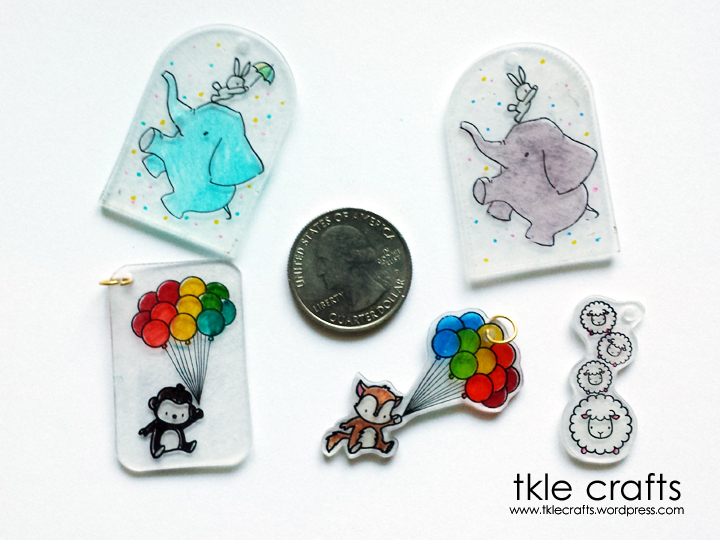 The shrinky dink version is about 1 inch tall!). Tell me this is not the coolest thing ever since…wink of stella??? lol. I find that really large stamp images (3 inches or wider) don’t seem to do very well because the edges curl and start to melt together. Again, I will have to update when I play around with different films, sizes, and images! I can’t wait to try and make dog tags, key chains, and…the possibilities are endless! So happy is me. These Ombre Inks are here to stay! I just adore them so much! I used the ombre inks for the thank you sentiment and background. For the banner, I turned it into a shaker banner by using a fun sprinkle of pretty pink posh sequins. 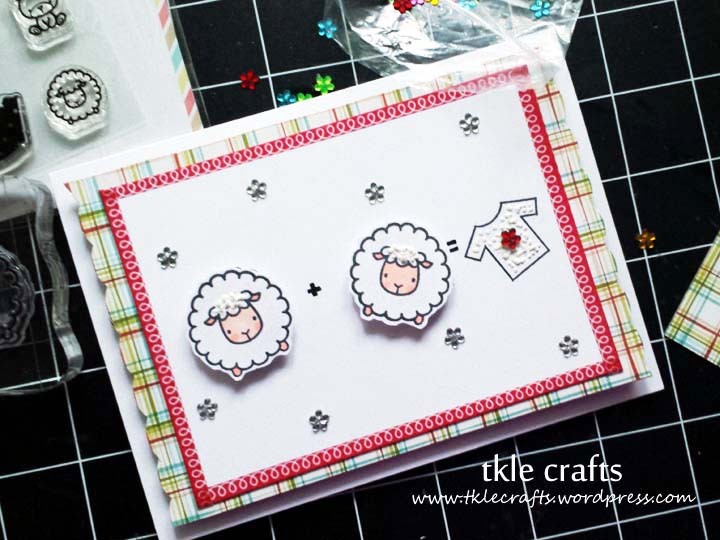 I thought it would be funny to shake the card and see the sheep bouncing around! lol! 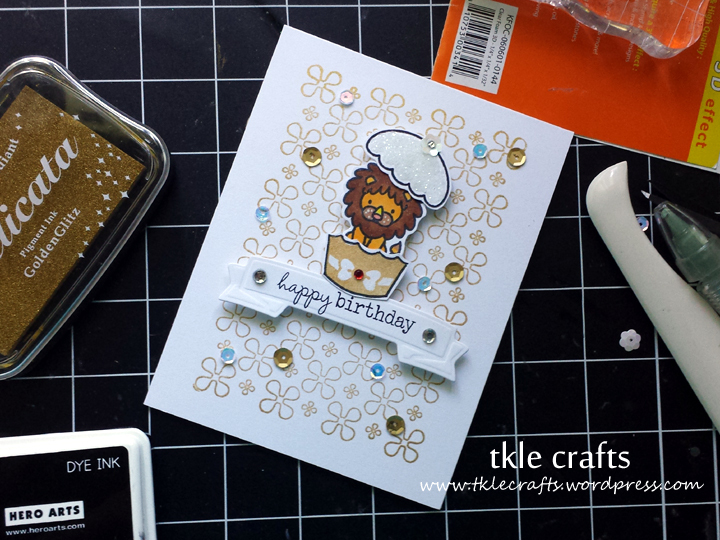 I love the layers of vellum and cardstock. 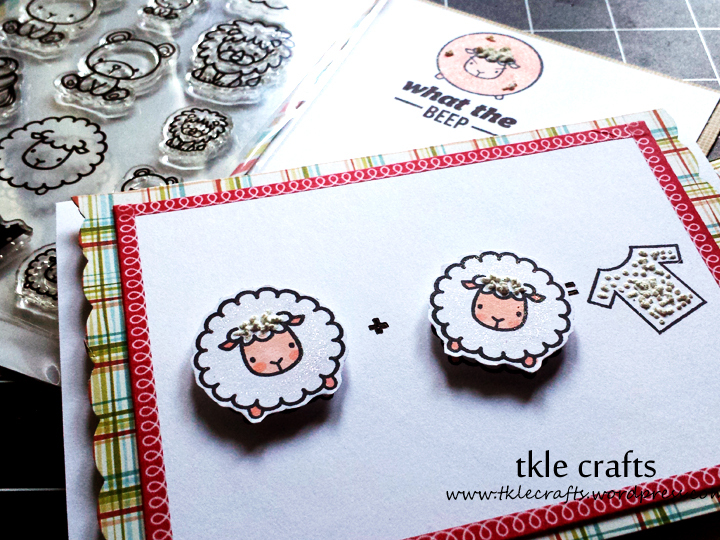 It just makes the card feel really special and that it’s made with love! Here is my attempt of combining different textures and layers! 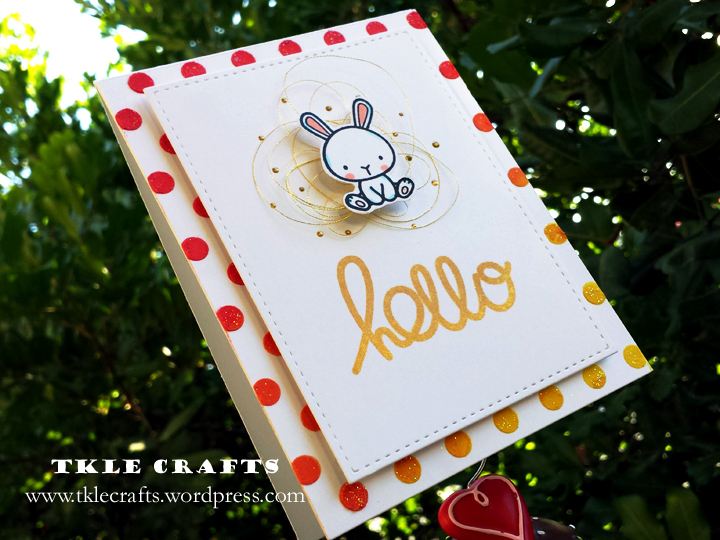 For the background, I used embossing paste to create the rainbow polkadot background. 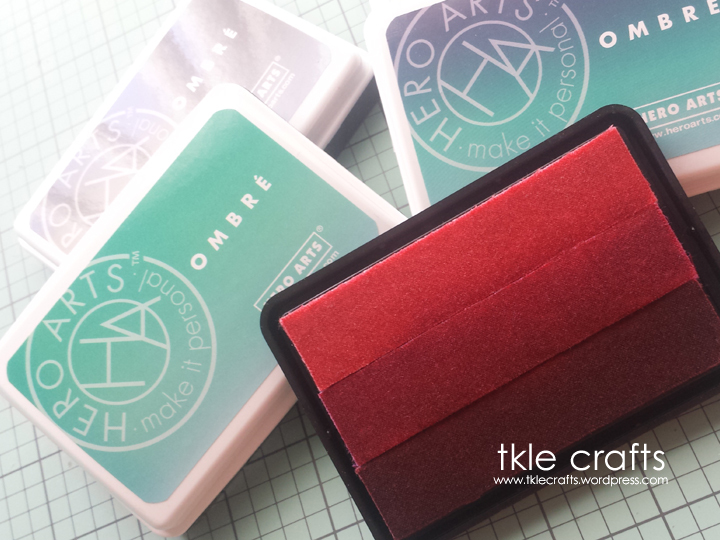 I just love sprinkling glitter on the embossing paste before it dries completely. It adds a little sparkle that makes you smile when you see it! 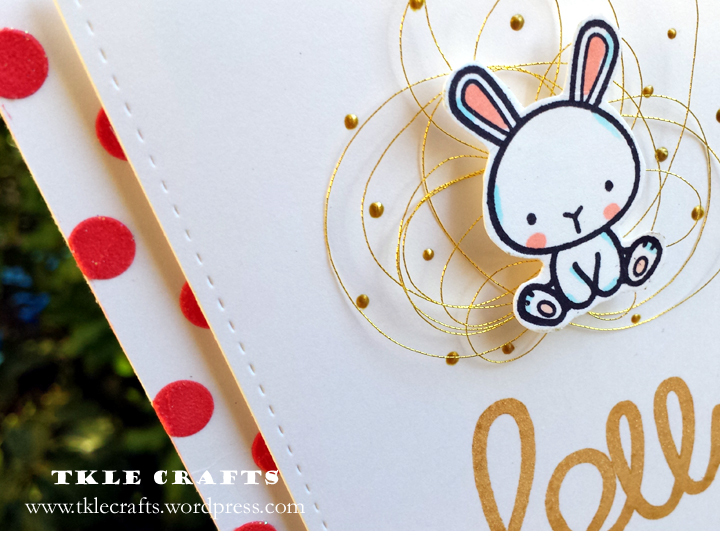 Love the gold thread behind the cute little bunny! I can’t believe it is already October! Time to get ready for Christmas cards! Roar…I’m sure that’s what you would hear if you took a bite into this little cupcake! 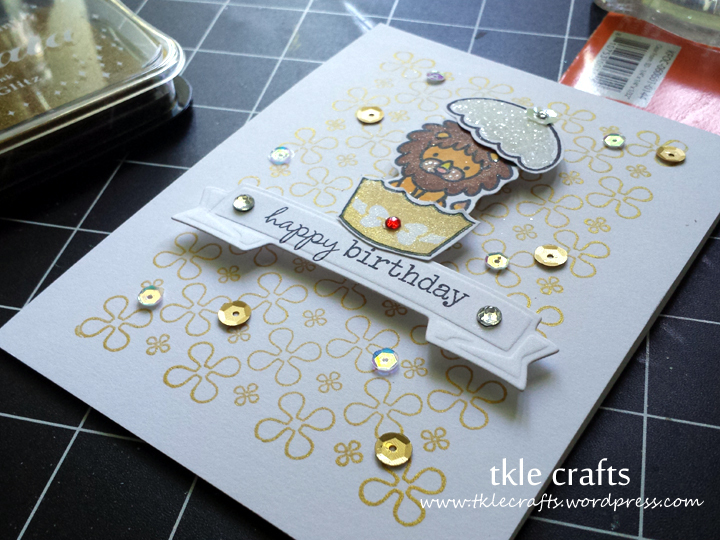 I just love this gold ink and background stamp. It’s that perfect combination. A Sheep with No Clothing?